With a heritage dating back to the early 19th century, this far-flung outpost of Van Diemen's Land (the former name of Tasmania) was once referred to in King George IV's Royal Charter as "a huge tract of unsettled land, beyond the ramparts of the unknown." 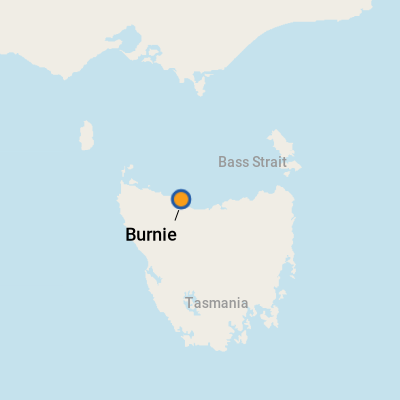 Burnie grew quickly, despite the harsh elements, and became known as an industrial port, servicing the international wood chip market. Piles of chips can still be seen at the port, although this gritty character is much less prominent these days. In many cases, visiting passengers will be heading off on shore excursions to places like the UNESCO World Heritage-listed Cradle Mountain Lake St. Clair National Park or the nearby historic town of Stanley, but for those hanging around, there is still plenty to see and do. Shaking off an outdated blue-collar persona, Burnie plays host to a number of fine attractions, including the Lactos Cheese Tasting and Sales Centre, where you can sample brands such as Tasmanian Heritage, Mersey Valley and Australian Gold. Premium food produce is a Tasmanian hallmark, and you'll find Australia's largest single malt whisky distillery in Burnie. Hellyers Road Distillery makes fine, single malt whisky, distilled from Tasmanian-grown malted barley and famously pure Tasmanian rainwater. It also distils the Southern Lights brand premium grain vodka. Exquisite Tasmanian seafood and wine can be had at Fish Frenzy, right on the waterfront. Local author Graeme Phillips describes this eatery as a "bright and spacious modern cafe with fresh fish and seafood every which way and then some." There are museums, galleries, craft workshops (the jewel being the Makers' Workshop), and gorgeous parks and gardens to stroll in while your sea legs wobble. The council has designated two Federation Walks for those interested in a combined dose of history and mild exercise. For others wanting some structure, a three-hour tour takes in the highlights while still leaving time for a bit of wandering.